We went for a walk on the beach with Scamp last Sunday, June 28th, around lunchtime. There was a sea mist falling and you could see only so far in front you. So we kept a close eye on Scamp as he was off the lead. He was having a good run around and coming back when called, for treats. Snuggles and I were paddling in the calm shallow water as the tide was out a bit. Every so often Scamp would join us. That was really nice as he's not too fond of water... but you see he was thirsty and was trying his usual trick of drinking the seawater!! We were enjoying ourselves and I was thinking that this could be a much calmer Summer with Scamp as he's calmed down a bit. Best get him home soon though, I also thought, and get him a nice big drink of water. So, we climbed the steps off the beach and up to the lane where one entrance to our local park is. He ran in to the park. I called him back while I was trying to fix Snugs helmet and sort out his bike . I didn't get to give him his treat so off he went again. But in which direction?? In to the park I thought, but Snugs thought he went the opposite way. Not wanting to hurt his feelings we went his way...but I still called out for Scamp. Unfortunately we went the wrong way and set off a train of events off that has clouded our whole week. We got home without Scamp. Sure he'll find his way home, just like he's done lots of times, I thought. Or we'll get the usual phone call that he's been found. You see, what Scamp usually does is follow other dogs and play with them. Then he gets lost. People looking think he belongs to someone else so no-one's too worried. He'll then trot off or follow someone or some dog home. And there he'll stay. He won't leave and I get the usual phone call to pick him up. he's also prone to accepting "lifts" from strangers.... if you know what I mean! No matter how many times I warn him about this! I went out to look for him when Mr Jazzy came back from golf. We then had to visit his brother in hospital (high blood pressure.. but he's O.K.) I really thought Scamp would have returned by the time we got home. I can't believe he's heading for his 5th night away from us. I also can't believe how much I miss him and want him back! Me, NOT Snuggles...he's not worried at all! Scamp is the bane of my life but I want him back! This week has been a mad flurry of printing, laminating and putting up posters. Not an easy feat I have to tell you. We have the slowest computer, in the Universe and a pernickity printer to boot. And I mean to boot.... literally!! And then some people take down the posters just as quick. Why do they do that?? If it was in only one area I'd be very suspicious! I've phoned Gardai stations, Vets and Dog pounds ..... in Dublin AND Wicklow. He has a collar with bone-shaped ID tag on... at least he had... and he's micro chipped. I've even phoned the micro chip company to flag him on their system. If he was stolen they'll dump him as soon as they realise he's chipped. Coming into our estate on the Monday...I didn't hear about this til Tuesday evening. IN Bray Sunday/Monday. I now think this was another dog but not sure. Most of the posters have since been removed. We searched this area lots of times. In an outer field of Shanganagh Park on Wednesday morning. We do twice daily checks in this park. I've borrowed a bike as it's quicker to search the park this way. God, I haven't cycled in years! I must look a sight ...on my neighbours bike (she's 5ft 7 and I'm 5ft 2!) and wearing my sons Wrestling helmet!! I don't care though.... needs must! Even Mr Jazzy's doing his bit. He searched the park in Bray at 6.30 am on Tuesday and took a half day yesterday as I was really sure that we were close to getting him. So, where are you Scampy?? Were any of those sightings you? Are you wandering the streets or park(s), with everyone thinking you're with someone else and no-one noticing you're all alone , tired and hungry?? Were you very scared all alone last night in the storm?? Did you get that drink of water you were so dying for?? Are you finding food somewhere? Or maybe you're like Lassie... and you're having an adventure. Maybe you've gone to help some child in trouble and will get home, defying all the odds, when you're done. I hope you didn't wander into the itinerant's camp like you did before.... that wasn't a very pleasant experience. Jump on any settee/chair you wish ANY time you wish! Climb on the kitchen Table and lick the plates "clean"!! Poo EVERY where.. and eat some of it .... preferrably in front of them as they're eating their dinner!! Scratch their back door to bits...and their front door. Hell, scratch ALL of their doors to bits! If you do all of this Scampy..... They'll want to get rid of you and they'll hand you in somewhere pretending they've just found you. If that doesn't work Scampy, they have to exercise you and I've told EVERYBODY to look out for you. When they walk you Scampy, escape the first chance you get and find your way home.... I know you can! But...psssst, Scampy....when you come home, none of the above applies! Normal serice will resume!! But you will get lots and lots of hugs and treats. And I will never give out about you again.That's a promise. The fact he's micro chipped is giving us hope. I've talked to so many people with stories of dogs turning up after some time. Petunia's friend's dog got into a bin and was found on the following week's bin day! My Abu-Dhabi childhood pal tells me her dog went missing for 6 weeks before being handed into a vet. A woman told me today about a husky stolen from a garden found wandering in Bray 4 months later....he'd been dumped when they realised he was chipped. There was even a dog re-united with it's owner after 2 years. All reasons to be hopeful. So, Scampy... we're looking for you sweetie. And Scampy ....... Be like Lassie, ..... and come home. I'm choking up reading your post Jazzy... I really really hope Scamp finds his way home to where he belongs soon and your nightmare ends. My friend couldn't believe it when her dog turned up after a week in someone elses garage! The owner had left the door open when pulling the bin through to the back and then shut the garage from the front so was only when he went to pull the bin through the garage he was noticed. He was skinny and hungry when he got back but a few roast chicken dinners later (yes she actually cooked a chicken just for him!) he is no worse for his adventure. We're getting to this a day late so really hope there is good news by now! One of the blogs we follow had posted up an appeal about a lost Husky last week and after a week the dog was found. So there is always hope! Poor you, the worry of this must be awful. Thanks Petunia...I will kill the fatted pig for the prodigal's return! Thanks Fiona. Yes, I am worried. But, I really feel he must be with someone by now. He can't possibly be still wandering around with no-one noticing, can he?? 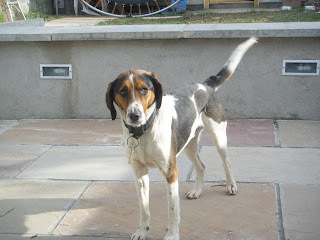 Hope Scamp is ok where ever he is, but i do hope he finds his way home to you. so sorry to read about scamp. it must be so hard not knowing where he is. really hope he comes home soon! oh I hope you find him soon Jazz. I really do! I hope he is back soon and please let us know. V.
Thanks Nan P, Casdok, 3laine, Hammie and V.
Phone call yesterday (Sunday) to say he was seen in the park/golf club last Thursday. We scoured the park y'day and today...no joy. I've another idea to try tomorrow.